Shonach Mirk-Robles received her classical training in some of the world’s best schools, including the School of American Ballet, The Royal Ballet School of London and Maurice Béjart’s MUDRA. She was a member of Bejart’s famed Ballet of the Twentieth Century from 1974 to 1986 and also performed with Switzerland’s Zurich Operhaus, Germany’s Hamburg Ballet and Italy’s Ballet de Torino. 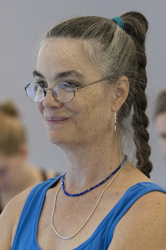 Shonach’s advanced studies in Spiraldynamik® have become the major influence in her method of teaching classical ballet. She studied Spiraldynamik® while also completing her MDEd. The combination of these two advanced trainings has dramatically informed her approach to teaching technique through the integration of Spiraldynamik® principles. Through her collaboration with acclaimed choreographers she has developed a deep understanding of what today’s dancers need in the way of a classical base for contemporary performance. Shonach founded her own school in Zurich in 2009 and also teaches, internationally in the US, Japan, Spain and Germany.